Royal Canadian Legion Branch 272 Hespeler is hosting a Motorcycle Ride and BBQ to raise funds for Wounded Warriors for support of veterans and families living with effects of post traumatic stress everyday. 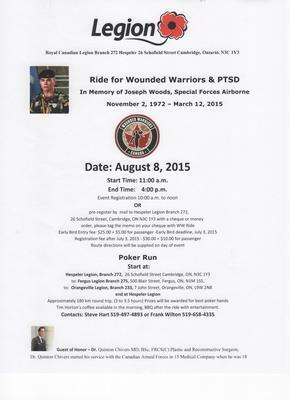 This event is a Poker Run and will start at the Hespeler Legion, proceed to the Fergus Legion and from there to Orangeville and back to the Hespeler Legion. Approximately 180 km. ride. Come join us for this great cause.